While Thanksgiving side dishes like mashed potatoes, Brussels sprouts, and mac and cheese are classics for a reason, others have gone out of style. Jell-O salads, desserts, and even leftover turkey creations have waned in popularity. However, some people still like to make ambrosia salad or candied sweet potatoes with marshmallows for nostalgia’s sake. No festive Thanksgiving gathering would be complete without a table heaped with steaming dishes. Thanksgiving celebrations revolve around food, but the recipes people follow have changed over the years. While Jell-O creations and canned products used to reign supreme, Americans have gravitated towards fresher, healthier options. Here are seven unusual Thanksgiving side dishes that people don’t usually make anymore — unless it’s for nostalgia’s sake. 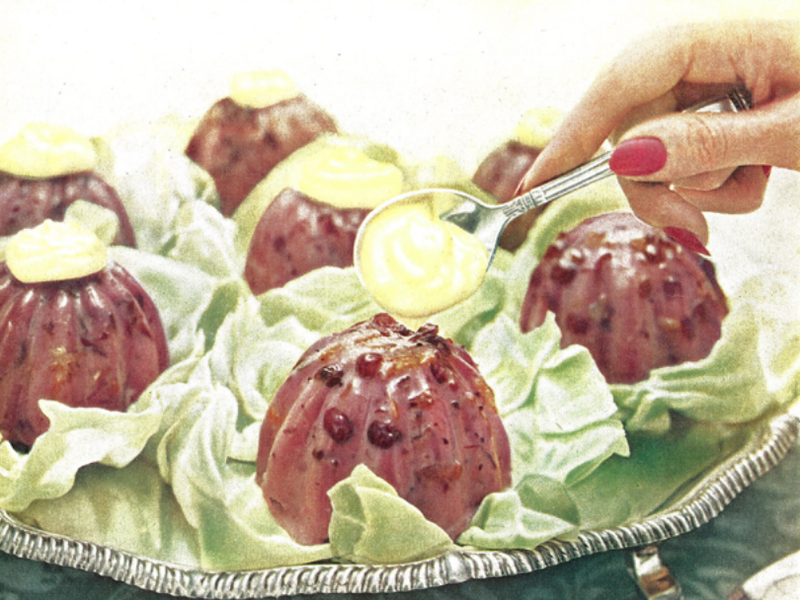 YouTuber and vintage recipe enthusiast MissSemiSweet tried a vintage Thanksgiving leftover Jell-O recipe from a 1975 cookbook called „Carefree Cooking with Aluminum Foil.“ The recipe called for turkey, frozen vegetables, cream of celery soup, and ranch dressing mixed with gelatin. „I’m not going to say that it’s horrible … I probably would not eat this again, but it’s not the worst thing I’ve ever had,“ she said. The dish was even promoted by Jello-O itself. Gelatin became a popular foundation for many meals during the ’30s, after the Great Depression, thanks to the fact that it was a good, but inexpensive, source of protein. According to the „The Oxford Encyclopedia of Food and Drink in America,“ close to one third of all cookbook recipes from this time period were gelatin based. In a 1968 advertisement, Dr. Pepper recommended serving „steaming hot“ soda over lemon slices. It definitely is „something truly different“ to offer Thanksgiving guests. Per Serious Eats, the drink was concocted by Dr. Pepper in the ’60s „to keep profits strong during the holiday season, when sales of cold pop plummet.“ Apparently, it caught on in the South where it is occasionally still drunk.